The USGS reported a magnitude 6.9 thrust fault earthquake occurring on Tuesday, September 9, 2008 at 5:52 am local time at a depth of 121.8 km. 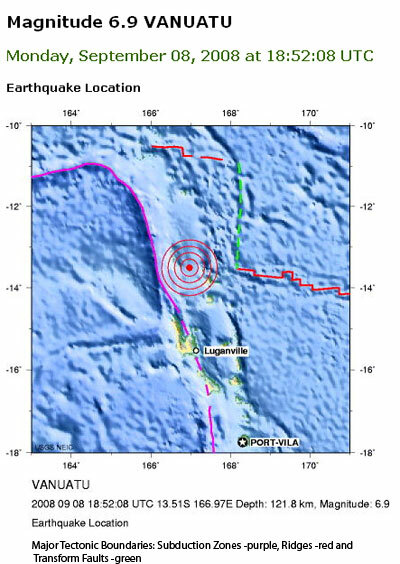 Moderate to strong shaking was reported from the Banks and Torres islands near the epicenter, and from Luganville on Espiritu Santo 225 km to the south, which is Vanuatu's largest island. There have been no reports of damage or injury, and a tsunami warning was not issued. Vanuatu is a nation of 83 islands located in the South Pacific, over 2000 km northeast of Australia. UNAVCO's Jim Normandeau and PI Fred Taylor installed a permanent station, one of UNAVCO's first, on Santo, Vanuatu in 1996 in an effort to install a permanent network of eight stations as part of the Southeast Pacific Project. At the time, the lack of Internet access and expensive telephone communications costs required the data to be manually downloaded and mailed to a collection facility. The data was originally being processed at the University of Hawaii. Looking back to early installation projects provides an interesting contrast to how far we've come in terms of data management and availability. Figure 1 - Map depicting the earthquake location. 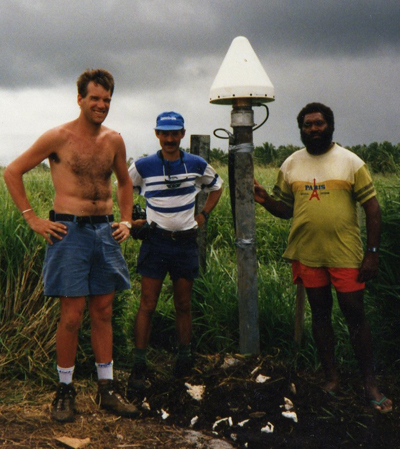 Figure 2 - Jim Normandeau, PI Fred Taylor, and David Nakedau (from left to right) stand next to the completed permanent GPS station on Santo Island in Vanuatu in 1996.